Often on the menu in a Chinese restaurant, this is easy to make. First obtain your squid. This could be fresh caught, shop-bought, or if you have kept your squid bait cool and clean you could cook up any leftovers as soon as you get home (seriously – I do). Most squid sold for bait is the same as boxes of squid sold to restaurants. Go to a Wing Yipcash and carry, you will see what I mean. 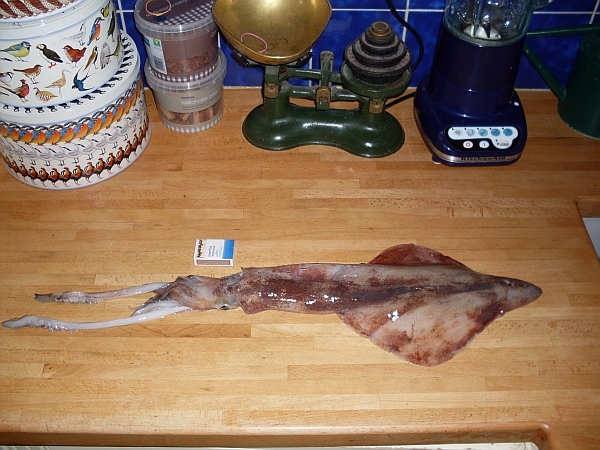 The amount of squid you have will determine whether you are about to make an appetizer, snack or meal. Prepare your squid by pulling off the head, cutting off the tentacles in a bunch just under the eyes (discard the eyes and guts), slit open the tube and scrape both sides clean with a knife. Cut into 2cm squares, rinse and pat dry on kitchen paper. P.S. Alternatively make a beer batter by pouring lager onto a handful of flour until it is the consistency of double cream, then dip your prepared squid into it before frying as above. It makes the lightest, crispiest batter!